Three people were stabbed after a small group of Ku Klux Klan members rallying in Anaheim clashed with a large group of counter-protesters, according to police. ANAHEIM, Calif. (KGO) -- Five Ku Klux Klan members who were arrested in a violent clash with counter-protesters have been released from custody, according to Anaheim police. After reviewing video, photographs and interviewing witnesses, officials said the Klansmen acted in self-defense. The violence broke out Saturday afternoon at Pearson Park, when police said 10 to 20 counter-protesters immediately rushed and attacked the KKK members who were there to stage an anti-immigration rally. Three people were stabbed, including one person critically, whose condition was later upgraded to stable. Police said that person was stabbed with the end of a flag pole. The mayhem spread across an entire city block as video captured victims bleeding from stab wounds and members of the KKK being stomped on by counter-protesters. Police said 12 people were arrested following the clash, including five Klansmen and seven counter-protesters. After releasing the five KKK members, the Anaheim Police Department released a statement in part that read, "Regardless of an individual or groups' beliefs or ideologies, they are entitled to live without the fear of physical violence and have the right, under the law, to defend themselves when attacked." 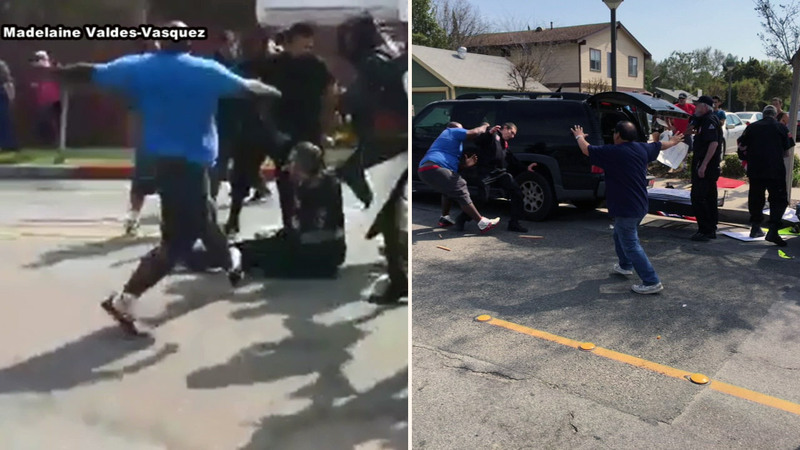 Officials also said a minor who was released following the violence was later arrested on Sunday after additional video was made available for their investigation. Police said he was arrested for assault with a deadly weapon and booked at Orange County Juvenile Hall. One suspect is still being sought in connection with the violence. The suspect pictured below is wanted for suspicion of assault with force likely to cause great bodily harm, according to officials. Anaheim police said this man was wanted in the connection with a Ku Klux Klan rally that turned violent on Saturday, Feb. 27, 2016. If you can help identify the suspect, you are urged to call Crime Stoppers at 855-847-6227. Callers can remain anonymous.